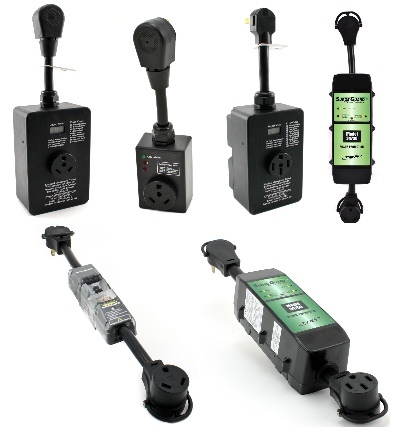 It’s a common misconception that surge protectors are merely fancy extension cords; however, as the name indicates, surge protectors protect from unwanted “surges” of electricity, keeping electronics and appliances from being fried. A surge in electricity originates from the source of the electrical current. Electricity is constantly running through power lines, much like water through a hose, and a sudden surge causes unwanted damage. Unless you use a generator, your RV will likely be hooked up to an unpredictable power source that is vulnerable to surges, and because RVs are more high tech these days, it is crucial that you have a surge guard for yours. So how should you decide which one is best for your RV? I’m glad you asked. When researching surge guards, first look at the size or Amp (ampere) rating. The Amp rating is the amount of current or energy flowing through your electronics/appliances at any given time. Check the main power plug on your RV to find out how much power your rig uses. There are adapters available for instances when your Amp rating isn’t compatible with the available power source. Next, look at the protection rating, which is measured in Joules. When too much electrical energy comes through the surge protector it will dissipate or divert the energy into heat. A higher Joule rating means the surge protector can dissipate or divert more energy, offering better protection. When looking at surge guards, remember, the higher the joule rating the better the protection! One option is to permanently hardwire a surge guard inside your RV’s power box/source. This approach is advantageous because there is no chance of forgetting to install your surge guard when plugging in at the campground. However, another option is to get a portable surge guard that you can simply plug into your RV and the source of electricity at the campsite. Portable units require no installation yet are still weather resistant and give warning when potential danger is imminent, which makes the portable option highly convenient. Now that we’ve covered the in’s and out’s of determining the right surge guard for your needs, you should know that there are many options on the market. Dyers Online offers an excellent selection of surge guards, including the popular brand names TRC and Progressive Industries. A standard surge guard, such as any of the TRC’s, will detect a problem and shut off. The advantage is this will save your RV from potential damage; however, you still won’t know what caused the problem and how to fix it. Progressive Industries offers models with an Electrical Mismanagement System, which has a built-in screen that displays a fault code. 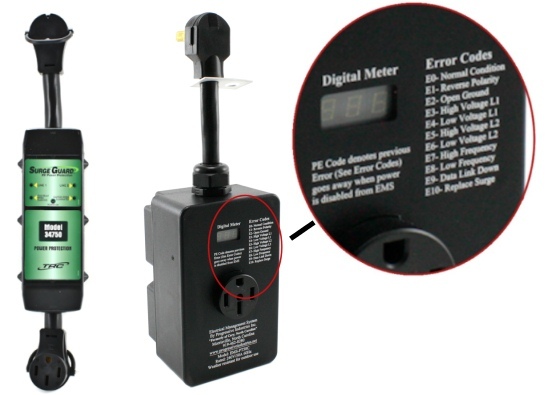 This makes not only diagnosing a power problem easy, but also makes it easy to explain to the park or repair man what needs attention to get you back up and running! Whichever product you end up choosing, I definitely recommend you get protected before your next RVing adventure!